The world commemorated the 20th anniversary of Diana, Princess of Wales’ untimely death on 31 August. Throughout the summer stories, headlines, magazines covers, lost interviews and new footage were being plastered across newspapers and the internet. Affectionately known as the “the people’s princess” for her magnificent charitable contribution and incredible humanitarian efforts, Diana’s has been present in the public eye since the late 1970s, when she first met Charles, Prince of Wales. In the ensuing years she redefined the royal dress codes and subverted expectations. Perhaps this is where Virgil Abloh’s journey began. The designer’s Off-White imprint’s Spring 2018 collection, shown at Paris Fashion Week earlier in the month, was influenced by the late royal. He didn’t want it to be an homage but an imagining of his hypothesis—what would she wear in 2017? The answer is what you’d expect. 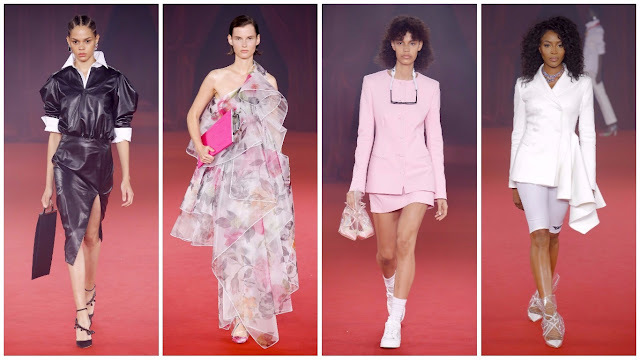 Abloh picked some relatively recognisable Diana looks and either cropped the jacket, swapped skirts for bicycle shorts and added a layer of tulle to almost everything, to achieve the princessy effect. Mayowa Nicholas emerged in a baby-blue collarless two-piece consisting of a jacket and mini-skirt; it was paired with white tennis shoes and striped socks, and completing the look was a pair of heels which she carried, favouring the functionality of trainers to the dressiness of heels. There was ebullience in the creative output but one felt the designer was desperately clamouring to compound his aesthetic with the regality of Princess Diana. In parts it worked: those brilliant tulle-cloaked denim pieces for example were innovative, and the bicycle shorts with suiting and trainers was a trip down memory lane. Ultimately, it lacked the incisive Off-White touch—it’s a shame, his womenswear is more inventive. Furthermore, alongside the main event, Abloh released two t-shirts to commemorate Diana’s anniversary. Proceeds from its sales will be donated to the American Red Cross and the British Lung Foundation, two causes dear to her heart. This wasn’t just an opportunity to imagine what one of the most stylish women in the previous century would wear today, but a chance to make a difference. One thinks Princess Diana would give her seal of approve.